John Cryer voted in favour of a referendum on the European Union last night in the House of Commons (24 October 2011). John Cryer MP joined 110 other MPs, including 79 Conservative MPs, in backing a motion for a public vote on Britain's membership in the EU. A total of 483 MPs voted against and defeated the motion. 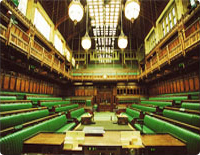 The controversial parliamentary debate and vote was held following a 100,000 strong petition. "The criterion for having a referendum is that a Government pass measures that seek to change the power of the ballot box-that is the time to seek a referendum and seek the consent of the British people. "Since the last referendum in 1975 which, as has been pointed out, was caused by the Wilson Government, we have had the Single European Act, the Maastricht and Amsterdam treaties, the growth and stability pact, and the Lisbon and Nice treaties. All those changed the power of the ballot box, most of them-not all-involving huge shifts of power from the democratically elected Governments of Western Europe to Brussels and Strasbourg. "We all recognise that there is generally a profound cynicism about the political process, not just in Britain but across western Europe. In this country, there are specific reasons for it, but last night we had the opportunity to restore a bit of trust in the political process. I disagree completely with the three-line Whip being imposed by all the parties. When the leadership of all three parties acts in that way, it tends to foment that cynicism. talking about the Liberal Democrats because we expect them to be inconsistent - said things about Europe when they went before their selection committees and their electorates and people now expect these things to be upheld tonight. People expect us to be consistent. "